ABSTRACT: Orthophragmines from late Lutetian (Alaman), Bartonian (Keasili) and early Priabonian (Sarkay) localities in Turkey are described and illustrated for the first time. Biometry of megalospheric individuals, based on a large number of free specimens sectioned mainly in the equatorial plane, contributes to our knowledge about the orthophragmines in several aspects. They are of western Tethyan affinity and belong to the evolutionary lineages of the genera Discocyclina, Nemkovella, Orbitoclypeus and Asterocyclina, knownmainly fromthe European part of peri-Mediterranean region. Identified foraminifera are categorized into evolutionary lineages, different developmental stages ofwhich are distinguished by biometrically defined subspecies. Two new species of Asterocyclina, A. sireli n. sp. and A. ferrandezi n. sp. from the late Lutetian and early Priabonian respectively, one subspecies of Discocyclina, D. trabayensis elazigensis n. ssp. and one of Orbitoclypeus, O. douvillei malatyaensis n. ssp., both from the Bartonian, are introduced. An emended description of Nemkovella daguini, the poorly known orthophragminid taxon (formerly ascribed to Orbitoclypeus), is given, with emphasis on equatorial development and generic position. 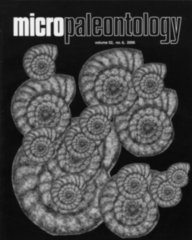 Stratigraphic position of orthophragminid populations is ascertained from the calcareous nannoplankton, planktonic foraminifera and the assemblages of accompanying larger foraminifera, such as Heterostegina, Spiroclypeus and some lineages of Nummulites (especially of N. fabiani and N. perforatus). The stratigraphic distribution of some orthophragminid taxa is rearranged and a revision of late Lutetian to early Priabonian orthophragminid foraminiferal zones (marked by OZ), in the context of shallow benthic zonation of Tethyan early Paleogene, is proposed. In the updated zonation, OZ 12 corresponds to the latest Lutetian to earliest Bartonian interval, OZ 13 to the late early Bartonian, and OZ 14 to the late Bartonian to earliest Priabonian time-span.